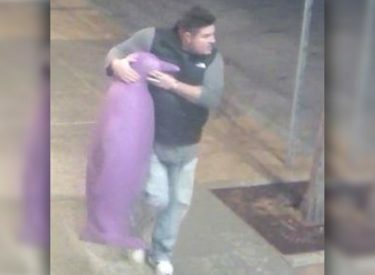 OKLAHOMA CITY (AP) – A large purple penguin statue that was swiped from a hotel in Oklahoma City apparently managed to waddle back home after police released surveillance camera images of a man with the $3,000 piece of art tucked under his arm. Hotel staff speculated that it was stolen by someone visiting a guest. Surveillance images show a man carrying the artwork by its head. The penguin is about two-thirds the height of the statue thief.